JAISAL NOOR, TRNN PRODUCER: Welcome to The Real News Network. 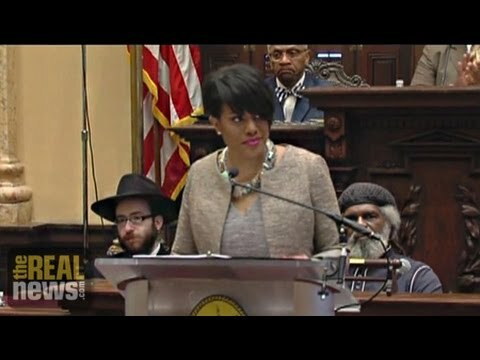 I’m Jaisal Noor in Baltimore, where today Mayor Stephanie Rawlings-Blake gave her 2015 State of the City address. A large portion of the speech focused on how to make Baltimore a safer city. The mayor talked about expanding a crime prevention program The Real News has reported on, Operation Ceasefire. STEPHANIE RAWLINGS-BLAKE, MAYOR OF BALTIMORE: With Our Partners at the federal level, we put nearly 90 members of a gang organization in federal prison with enhanced sentences. Meanwhile, the department’s Operation Ceasefire led to a 45 percent reduction in homicides in the Western District. And this year, we are expanding Operation Ceasefire to the Eastern District. NOOR: Well, now joining us to respond to the mayor’s state of the city are two guests. Neil Franklin is a 34-year police veteran who ran training for the Baltimore Police Department, currently serves as the head of Law Enforcement Against Prohibition. We’re also joined by Clayton Guyton. He’s the director of the Rose Street Community Center. CLAYTON GUYTON, DIRECTOR, ROSE STREET COMMUNITY CENTER: Thank you. NEILL FRANKLIN, EXECUTIVE DIRECTOR, LEAP: Glad to be here. NOOR: So, Clayton, we interviewed you for the story we did about Operation Ceasefire. And Operation Ceasefire, it aims to reduce homicides, something you’ve been doing for years in the Eastern District. Now, you said you support Operation Ceasefire. It seeks to identify the most at-risk populations to commit homicides or to be victims of them, and they have a call-in, and they say, hey, we’re going to give you the support to get out of the game, or we’re going to kind of throw the book at you. And you say you support this program, but if it’s done right, if the services and resources are provided to give people an alternative. And you’ve raised those issues with the mayor and with the city. So what’s your response been to the mayor’s announcement today that she’s expanding Operation Ceasefire into your district? GUYTON: Well, they are not taking the motivation of the community into perspective. The community, no matter who they are, they’re somebody’s sons, fathers, they’re the fabric of our community no matter how you look at it. And so, therefore, we have to take a more humane approach towards rehabilitation of those that they are identifying is criminals. Don’t just say, look, this guy’s a career criminal. From your police perspective, that might be true, but from the community perspective, he might be a providing father, he might be a grandfather that his children setting on his knee, he might be a person in the street that’s keeping other people from doing crimes. So they full perspective on who they calling in is not fair. And that’s what we as a community need to bring to their attention. NOOR: And so, Neill, Ceasefire, it’s presented as an alternative to this old way of policing, where you just–where you have things like zero tolerance, where you go in and you think everyone’s guilty, but you go in. And so, instead of that you go in, you identify the most at-risk populations, and you give them the support they need to get out of the game. So what’s your reaction to this announcement that Ceasefire is going to be expanded? FRANKLIN: Well, I guess the one concern I have is about ownership, community ownership. And I kind of think that’s what I hear Clayton saying. You know, when you have community ownership and you really have the buy-in of the community and you get the right information, when you had that, you’re going to get the right information from the community as to what the needs are of the community. So, for instance, expanding Ceasefire into the Eastern District, where Rose Street is and all the great work that’s already being done there, I’m just hoping that it won’t be disruptive to the foundation that has already been laid there. I think there are a lot of examples. And you can look at the work that’s been done on Rose Street and take a lot of that and incorporate into Ceasefire. But I think the key, again, is ownership of that community and getting their 100 percent buy-in, and so they feel like they’re giving information to this Ceasefire program. NOOR: And so, Clayton, you had a chat with the head of this program for the city and you’ve expressed your concerns to him over the last few weeks, and before that as well. Can you tell us how the conversation went and whether they’re receptive to your concerns? GUYTON: Well, receptive to the concerns, but not in a sense that funding will be provided for them. I mean, the conversation was cordial. The person that we talked to was cordial, you know, a very nice person. I mean, I would invite him to dinner. But when it comes to saying, look, let’s put some funding into mental health, let’s put some funding into housing, let’s put some funding into different aspects that would actually help reduce or provide rehabilitation [strain (? )], that’s not happening. All we hear about is what the police is going to do. So that’s going to increase their aggression. Police are going to call them in, tell them, look, if this happens, not only are we going to lock you up, but we’re going to lock the people up that you know. Now, that’s some 1960s tactics, and that’s what the commissioner, Betts–he indicated that when he came to Baltimore he didn’t realize how far back we was. We’ve taken a page out of the ’60s, which he realized, but he won’t expand on how far that go, but that part of that Ceasefire, because it’s about locking up African-American men. That’s what it’s about. NOOR: And so we’ve talked to the experts. We’ve talked to Daniel Webster, who is the leading expert on this program in Baltimore. And he says that this is the most difficult portion to fund. And you’re talking about people that work in the community that connect these same individuals to the services. And they reinforce that message and they make sure they’re on the right path. And you’re being told this is not being funded in the plant. And so what’s your concern? And what could go wrong if you don’t have that part funded? GUYTON: Well, if we don’t have that part funded, the aggression level, you could take anybody. I mean, you don’t have to say, well, this person is criminal, they’re ex-felon. You can take anybody, a normal–what you would consider a normal citizen, and say, look, I want you to do this, but I’m not going to put any money into it for you to do it. That right there, automatically I’m mad right off the top. You want me to do something, but you don’t want–I can’t eat, okay? I mean, I can’t–you’re not giving me the training, you’re not giving me the education to help me change my mind. You already know it’s difficult for me to change my mindset. You know the amount of time, you know the psychological trauma that I went through to get to this point in life. So now all you’re saying to me is you’re going to jail. NOOR: And so, Neill, the mayor said that this has worked in the Western. She said we’ve see a 45 percent decrease of homicides in the Western District. Now–. FRANKLIN: We’ve seen this before across the country, where when it’s a law enforcement, a police-centered program, it’s not sustainable. And that’s a problem. We did this very same thing around the state. We did it in Annapolis. We did it in other parts of this state in the past. So here’s what we’re saying. If you want sustainability, you’ve got to provide those services for making the community healthy, say, health, nutrition, housing, jobs, the right jobs. NOOR: A big part of this is having jobs. GUYTON: Absolutely. When you talk to them, right, they say, this group of people don’t want jobs. Where are they getting this from? Yeah. When you ask them, they say, look, we threw jobs at them, but they won’t. They won’t. They won’t. That’s racist policies. You need to change your thinking to do things differently. Now let’s talk about the Western District for a minute. From January 1 up to today, seven homicides. From January 1 up to today, Eastern District, two homicides. Why are you going to roll out a Ceasefire program in a community that only had two homicides the whole district wide, when you have other communities in Baltimore City and one homicide is too much, where mothers are crying all the time? Eight homicides, ten homicides. You are not even finishing the Western District. What is an acceptable level? Is seven acceptable? As you say, oh, seven is okay, so now we can roll over to another community. There’s something wrong with that whole thinking. Somebody is on the run page of this. NOOR: And we contacted City Hall, we’ve contacted the mayor’s office several times about this specific concern. They didn’t respond to us. NOOR: I did catch up with Councilman Nick Mosby, who when we told him your concerns, he said he was going to talk to the mayor, talk to the Office on Criminal Justice. They haven’t responded to him yet either. So we’re still waiting to hear back responses. GUYTON: Well, if they can’t respond to somebody that’s sitting right down the hall from them, how in the world are they going to respond to us, who is two miles away from them? It’s not adding up. But there’s other motivations here that we need to explore, the reason why they want to put Ceasefire in our community: redevelopment, gentrification, Johns Hopkins. There’s a lot of investment going on out there. NOOR: You’re just down the street from the Johns Hopkins campus. GUYTON: Absolutely. And it’s one of the smartest institutions in the world. And you can’t come up with a plan to reduce homicides in a humane way? Something wrong with that. NOOR: Well, true public safety is a community responsibility. But that community’s got to be healthy. And that’s where you need the foundational services for that community to be healthy. Again, if it’s police-centered, it’s only temporary, because the police cannot be there in the numbers that they are doing the things that they do, which we don’t all agree to anyway as far as zero-tolerance policy, can get to that place if we’re not careful. But they can only be there for a period of time. It’s the community that has to do this. So give the community the resources that they need so that they can become a healthy functioning community. And you know what? You’ll never need the police back in that community. NOOR: And while you guys are here, I wanted to get another response to what the mayor said. She said she’s going to expand police patrols in communities. And she also said that the issue of police accountability is being addressed and there’s fewer complaints against police officers. RAWLINGS-BLAKE: People in Baltimore want to see more police on the streets. So, last month we launched a new system of scheduling our patrol officers. This new schedule is expected to produce real results for our residents. Complaints alleging excessive force are down 46 percent. Police discourtesy complaints are down 53 percent. Notice of lawsuits alleging police misconduct are down dramatically over the past three years. GUYTON: Fewer complaints about who? The same people they’re talking about locking up? So what are they saying to them? Look, I’m not going to lock you up if you don’t complain. Who are they talking about? Who are these–who are the people that they’re talking about? We have to look at the whole picture. And that’s the one thing that they will never give you. They’re always talking about these percentages. Well, what about the rest of those percentages? Just look at that particular population of people. So all this, this is a numbers game for them to come into our community for other reasons: reinvestment, gentrification, and locking up people so that they can get a perception that our community is safe because of the police department. And that is not true. They don’t tell you how long they’re going to stay the community. Suppose they come in the Eastern District and only stay one year. Now when you roll out, you done left a train wreck behind you for the community. And that’s why Rose Street wanted to get involved, because we don’t want a train wreck left when they leave, because that’s what’s going to happen. NOOR: Neil, I wanted to get your response, because a lot of this ties back to the war on drugs. You were a former footsoldier in the war on drugs. Now you’re head of Law Enforcement Against Prohibition. Give us your perspective. FRANKLIN: How much time do we have? ‘Cause you’re talking about an octopus with about 24 tentacles on it. Again, from my perspective, I see the foundation of a lot of the problems that we have on many fronts as again being the drug war. The violence that we have in many of our communities is still the foundational pieces, the competing factors there of people wanting to sell drugs, okay, and not knowing how to manage that among themselves, so where you eliminate the violence from it. On the other side of that coin–and this coin has many sides–then you have law enforcement coming in to enforce these crimes. So they’re going to lock up anybody that even looks like they have anything to do with drugs. Okay, whether they’re selling or if they have a health issue of addiction. Okay? And so we’re locking them up, putting those people in worse conditions and worse place. And when they do finally come back out into the community, they’re now saddled with a conviction. Now they’re never going to get a job. So where do they stay? They stay in the drug trade, they stay in that world. And if they’re addicted, then they’re out committing other crimes to finance that addiction because we don’t have the services that they need, such as on-demand treatment and so on. I still see the drug war as a significant piece of the foundation for the disintegration of the black family in many of our communities across this country. And we’ve got a long way to go to repair that, to fix that, so that we could start rebuilding our families. And you’ve got to rebuild your families before you can rebuild the communities that they live in and the neighborhoods that they live in. And that’s what this is about. And in order for us to do that, we have to end the drug war, man. We’ve got to end the prohibition of drugs. And we’ve got to–I’ll end with this, at least as far as my comments go–the 50th anniversary today of walking across the Pettus memorial bridge. A few years back, there was a police chief down there in Selma who apologized to John Lewis about what the police did on Bloody Sunday. Now, he had nothing to do with that, but he apologized to them in public, saying that the law enforcement community owes you an apology. You know what? We need to do the same thing today regarding the drug war. The law enforcement community owes the black community an apology and the brown community an apology and the poor community an apology for how we’ve gone about enforcing these drug policies in this country. NOOR: So we know Operation Ceasefire is going to be rolled out in the Eastern in the next few weeks. We’re going to be keeping a close eye on that. So thank you for joining us. GUYTON: Thank you for having us. FRANKLIN: Thanks for having me.